Thousands of new homes are being built around the country each year. Many other homeowners may be choosing to remodel or update their existing homes. In either case, a homeowner has the power to make informed choices to live in a greener, cleaner environment by incorporating some cost-effective and sustainable materials into the design. Whether traditional or modern, natural stone can support your goals to green your home. Green building design continues to change, evolve, and grow in importance. Many green building rating systems have been created and have expanded over the years to more consistently define sustainable design for different building types. At the same time, the programs have become more accessible and a more user friendly process. Perhaps you are already familiar with a few of these rating systems, including the US Green Building Council’s Leadership in Energy and Environmental Design (LEED), which is the most popular program in use within the US and abroad. Over 2.2 million square feet are LEED certified every day with more than 92,000 projects using LEED. It is also very flexible and works for all building types anywhere. LEED is in over 165 countries and territories. LEED buildings also save energy, water, resources, generate less waste and support human health. LEED buildings create long-term value and attract tenants, cost less to operate, and boost employee productivity and retention. Projects pursuing LEED certification earn points across several categories, including materials, energy use, and air quality. Based on the number of points achieved, a project then earns one of four LEED rating levels: Certified, Silver, Gold, or Platinum. The process is designed to inspire project teams to seek innovative solutions that support public health and the environment, while saving owners money over a project’s life cycle. A home is more than just shelter. Homes are the most important buildings in our lives. The USGBC thinks that every building should be a green building—but especially homes. Why? LEED homes are built to be healthy, providing clean indoor air and incorporating safe building materials to ensure a comfortable home. Using less energy and water means lower utility bills each month. In many markets, certiﬁed green homes are now selling quicker and for more money than comparable non-green homes. 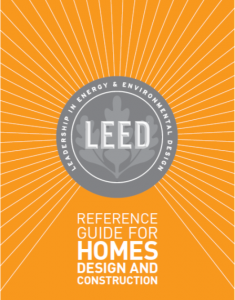 Some of the most important buildings in the world use LEED. Shouldn’t the most important building in everyone’s world, their home, be green, too? 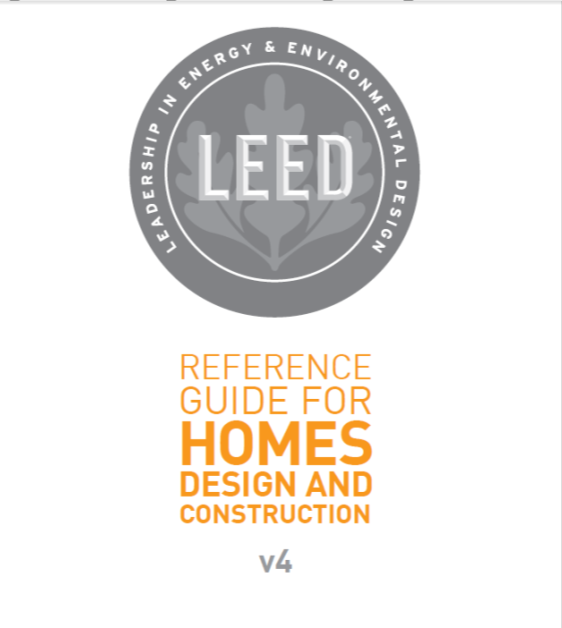 LEED for Homes was created and is available for single family homes and multifamily projects up to three stories. How can Natural Stone Support a LEED for Homes Project? Natural stone has many of the qualities and characteristics that support green building design. Natural stone is very durable, has low maintenance, does not off-gas, and also can be water resistant, reflective, and nonporous, depending on the stone. These qualities are essential for creating a home that will last, as well as one that will be healthy inside and out. 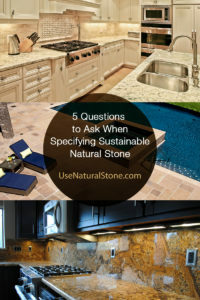 Consider natural stone to achieve these benefits, whether or not you are seeking a LEED rating. 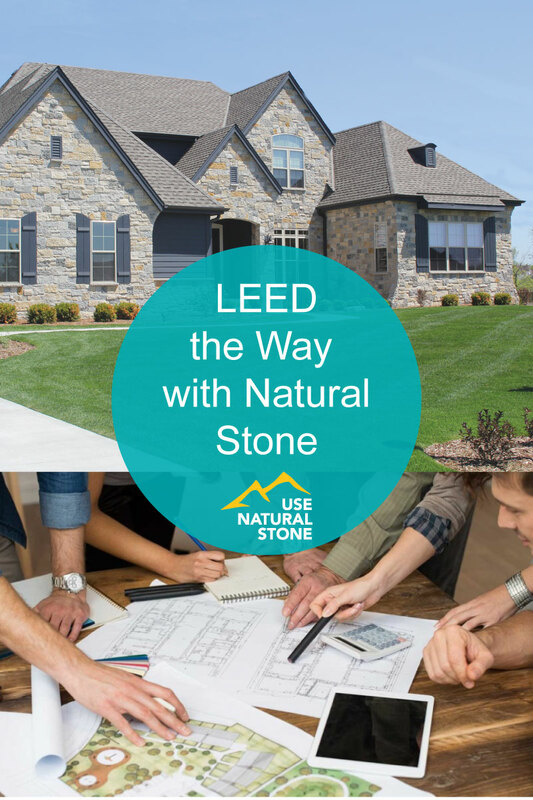 Several points in different categories within LEED for Homes can be achieved using stone, whether stone is the main material or part of a system or overall strategy. A few of these credits are discussed below. 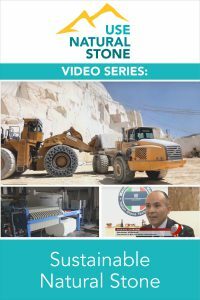 This will help you better understand how to consider and work with the right stone to achieve the credit. It really starts at the beginning of the project. 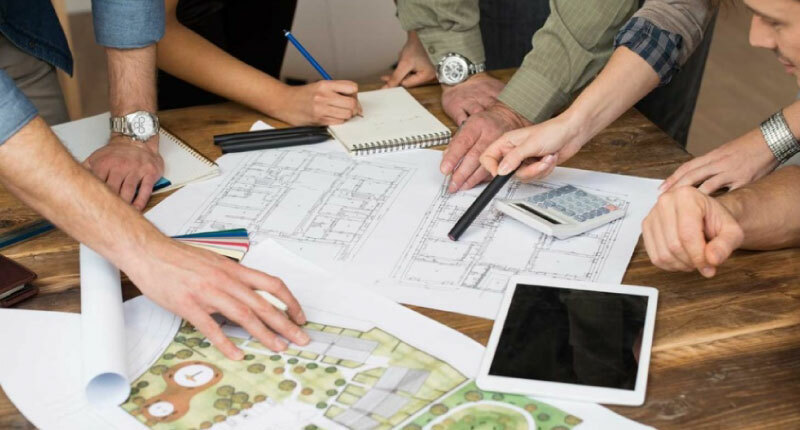 Having the right team onboard and the knowledge of what materials would best support the project will save you lots of time and money down the road and help you successfully meet your goals. The following offers insights into LEED Categories and credits that can be achieved using natural stone. For the comprehensive approach to the credit, please visit USGBC in order to ensure that you are applying the most current information. The intent of this credit is to maximize opportunities for cost-effective adoption of integrative green design and construction strategies. This is a great opportunity to discuss the reasons you wish to incorporate stone and decide upon potential credits and points that could be achieved with stone. It is important to get your stone supplier, contractors, and installers involved in order to engage them in the process early and make the most effective decisions regarding the type of stones to use and the role they will plan in the green design elements. The intent of this credit is to minimize effects on microclimates and human and wildlife habitats by reducing heat islands, which are caused by disturbances to the natural landscape, and temperatures rise as a result. This can cause additional heat on the home and surrounding site, which in turn creates the need for more air-conditioning in summer. Install light-colored, high-albedo natural stone in hardscapes in order to reduce heat gain on the site. 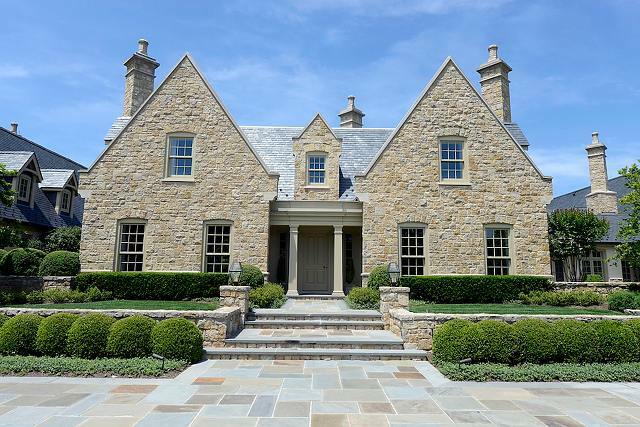 Two exterior strategies with natural stone offer different sustainable benefits. The image on the left is a green scape combined with stone pavers, which allows for water to drain effectively. down through the grass, reducing water run-off, while also providing a useful outdoor space. The hardscape on the right takes advantage of the light color of the chosen stone, which reduces heat gain on the area and results in a more comfortable environment. The intent of this credit is to improve the home’s overall energy performance and reduce its greenhouse gas emissions. 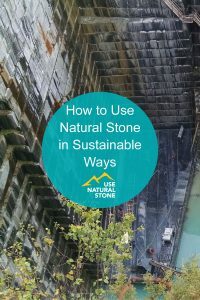 Using natural stone, which has thermal properties and does not off-gas, should be a part of the high-performance building envelope, since it will perform well over time, supporting a reduction in energy use, thereby also saving valuable resources. The intent of this prerequisite is to promote durability and performance of the building enclosure and its components and systems through appropriate design, materials selection, and construction practices. Use water-resistant flooring in the kitchen, bathroom, laundry room, spa areas, and entryways. Using a durable and water-resistant material in the home like natural stone can support your Materials and Resources goals, reducing the chance for mold and moisture problems. The intent of this credit is to reduce occupants’ exposure to airborne chemical contaminants through product selection. In the interior of the home, use products that have been tested and found compliant with the California Department of Public Health Standard Method V1.1–2010. At least 90% of a component must meet the requirements to earn credit. As mentioned above, natural stone does not off-gas, and so should be considered as part of your low-emitting product strategies. Remember to coordinate with all the other low-emitting installation materials, such as backings, adhesives, and sealants that support the stone design, to ensure the entire system is low-emitting. The Innovation (IN) credit category encourages project planning and design to improve the coordination and integration of the various elements in a green home. 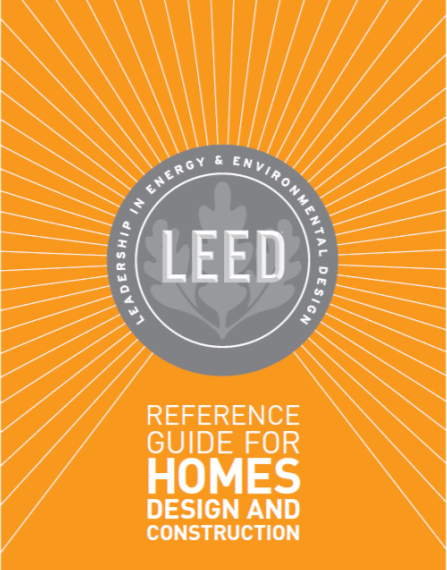 This category also creates an opportunity for projects to earn credit for implementing strategies or measures not addressed in the current LEED for Homes system. 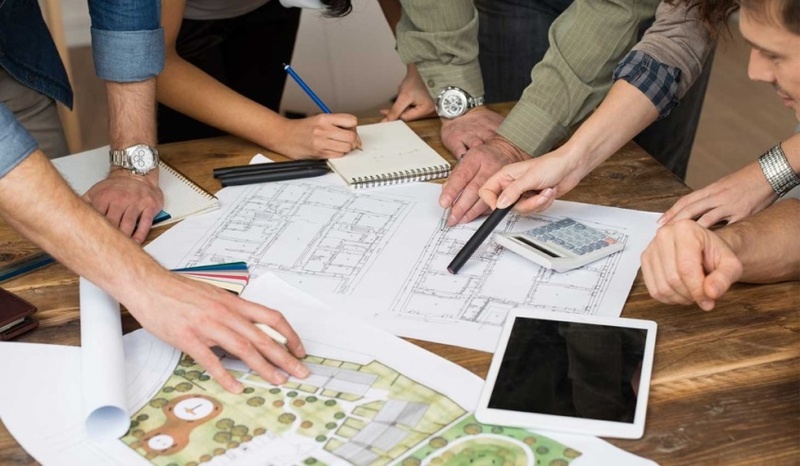 Good design that goes beyond the requirements can keep costs down and ensure proper integration of green techniques and achievement of project goals. Remember to consider new and innovative uses and approaches to natural stone that could qualify for points in this category. 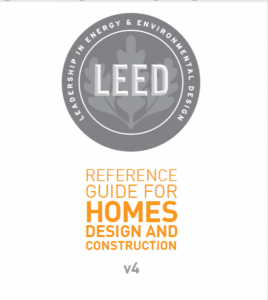 There is a particular process for achieving a LEED for Homes rating. Be sure to check out the resources at USGBC before getting started. No matter the size, location, or style of home, you can choose to implement some of these ideas to create a healthy environment and enjoy the benefits of a sustainable home for many years to come.